Since the refugee crisis came to a head in autumn 2015, migration, refugee policies and asylum laws have been dominating the political agenda in Germany and Europe. The EU is facing a crucial test. Yet there had already been signs of the crisis for a long time. The distinguished historian and political scientist Hans-Peter Schwarz adds a historical dimension to the present discussion. 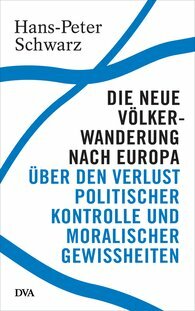 He demonstrates how mistakes in the construction of the Schengen agreement and EU refugee laws have made the present situation possible – and how erratic policies of improvisation and muddling through, not to mention signs of EU disintegration, have further exacerbated it. Precisely and to the point, Schwarz analyses the problems of this once-in-a-century task and suggests five guidelines for a new course in refugee policies. "The book's strength lies in its detailed, circumspect and profound presentation of global political events."